If you have been reading my blog for a while it will come to no surprise when I saw that Bubba loves music. Ever since he was small he has loved musical instruments, singing, dancing...basically anything that involves a bit of music. 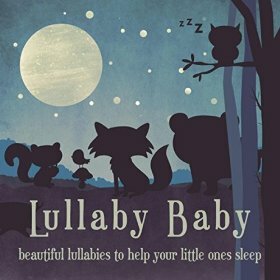 Recently we were sent a lovely album full of some beautiful nursery rhymes and lullabies called Lullaby Baby from Nursery Rhymes 123. Nursery Rhymes 123 began in 2010 as a collaboration between BAFTA award winning director and father-of-2 Dan Smith and UK based singer-songwriter Martha Bean. Having been frustrated at the lack of good quality children's music available on YouTube, they decided to create some beautiful music that no only children would love, but that wouldn't drive parents around the bend as well. They defiantly achieved that with this album. Including the classics Row your boat, rock a by baby to more contemporary numbers like You are my sunshine and Lavenders Blue, which was featured several times in the new Cinderella from Disney, there is something for everyone on. This album is aimed to help soothe and calm young babies and children and with its beautiful strings and piano tracks. I have to mention the voice that is on this album. I believe that it is Martha Bean singing and her voice is so hypnotising and relaxing..it's honestly beautiful and even makes row your boat sound like an indie master piece! This album is available to purchase on ITunes for £7.99 or you can listen to the album in full on Spotify. You can also grab a copy on all major download and streaming sites including Amazon, Google Play and Apple Music. To visit Nursery Rhymes 123's website and see the other albums they have on offer, click here. Note: this album was sent to me free of charge for review purposes but all opinions expressed are honest and my own.